Launched Studying Islam www.studying-islam.org a website that offers online courses on Islam in English and in Urdu. Launched a Islamic Query Service (IQS), an email based service that answers questions on or about Islam. Till Dec 2003 more than 3000 questions have been answered by this service. Deputed as President, Al-Mawrid’s Centre for Islamic Communications. The objective of this centre was organization and marketing of various media of Al-Mawrid as journals, audio-video cassettes, lectures, seminars to disseminate and propagate the message of Islam. 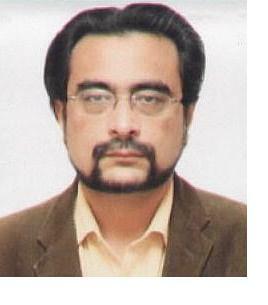 Appointed Vice-president of Al-Mawrid and as Director of the Research Department for sometime during this period. Was also Associate Fellow for some time during this period. Appointed Director, Al-Mawrid. Job responsibility included development of Al-Mawrid and managing all its affairs. Director Administration, Al-Mawrid. Job responsibility involved assisting the President in the administration of the institute. This ongoing project is a translation of Ghamidi’s Al-Bayan from Urdu. The idea in this exegesis is to unfold the coherence in the Qur’an through the translation itself keeping the explanatory notes to a bare minimum. Work on the last group of the Qur’an (Surahs Mulk- Naas) has been completed. Islam: A Comprehensive Introduction (Urdu title of Mizan) is an extensive study of the contents of Islam by the author. It is an effort which spans almost two decades of both creative and critical thinking. The entire endeavour is a fresh interpretation of Islam from its original sources. In his own opinion, the reason that he has undertaken it is that interpretation of sacred texts is a human endeavour and since this can never remain fault free, the process should never discontinue. It is as a result of this principle that the author has continued to evaluate and re-evaluate even his own findings. Islam: A Concise Introduction (Urdu title of al-Islam) is a condensed version of Mizan, a comprehensive treatise on the contents of Islam by the author: Javed Ahmad Ghāmidī. The author himself has produced this abridged version. In order to understand divine religions, it is essential to comprehend a certain unalterable practice of God. Simply put, it is: God, through natural disasters or through His messengers, punishes and humiliates in this very world their foremost and direct addressees who deliberately deny the truth, and rewards in this very world those among them who adhere to the truth. However, many scholars have misread this practice of God; they have regarded it to be a part of the shari‘ah, and as a result think that after the departure of the Prophet (sws), later Muslims too have the right to punish and subjugate people who deny the truth. As a consequence of this misreading, many other erroneous inferences have also resulted. Matters which were to be left to God have been taken up by human beings. In this manner, they are now guilty of inadvertently playing God. This Book describes this divine practice in detail in the light of researches carried out by Hamid al-Din Farahi (1863-1930) and Amin Ahsan Islahi (1904-1997) and Javed Ahmad Ghamidi (b. 1951). One significant reason for the various misconceptions which exist about Islam is the erroneous presentation of the stance of Islam on certain issues by some of our scholars. In recent times, the works of Hamid al-Din Farahi (1863-1930), Amin Ahsan Islahi (1904-1997) and Javed Ahmad Ghamidi (b. 1951) have served to clarify some of these misconceptions. Although these misconceptions are numerous, presented in this booklet are some common ones. Most of them have been clarified by presenting excerpts from the works of these scholars, whilst in some cases, the author has attempted to dispel them himself keeping in view the approach adopted by these scholars. Many controversies regarding the stance of Islam on women have arisen because of misunderstanding the view of Islam in this regard. In recent times, the works of Hamid al-Din Farahi (1863-1930), Amin Ahsan Islahi (1904-1997) and Javed Ahmad Ghamidi (b. 1951) have attempted to clarify the stance of the Islamic shari‘ah on various issues. Most of the clarifications presented in this booklet are based on their research. This tract critically analyzes the traditional view on the collection and transmission history of the Qur’an and presents the research of some contemporary scholars like Farahi, Islahi, Ghamidi and Imadi. It also presents the view of the Orientalists. This exposition presents a fundamental premise which must be understood if one is to properly understand the Qur’an. As per this premise, there are certain directives of the Qur’an which have a specific application and cannot be extended beyond this sphere. This article discusses various directives of Islam regarding non-Muslims and goes on to show that they have a specific sphere of application. Some of the conclusions drawn are: non-Muslims of today cannot be waged war against in the name of religion, Jizyah cannot be imposed on them and apostates of today are not punishable by death. The article is developed on the basis of research work carried out by Ghamidi. This booklet (currently under print) contains a translation of fourteen short surahs of the Tadabbur-i-Qur’an, a monumental exegesis of the Qur’an by Imam Amin Ahsan Islahi. In this article (published as a booklet as well), Ghamidi’s ideas have been presented regarding the Islamic guidelines for the economy and economic activity. This article also presents the outlines of Ghamidi’s proposition for managing finance in the economy in accordance with the principles of Islam. This proposition is based on the premise that Banking -- Institutional Credit Creation to be more precise -- cannot be run without interest and, therefore, the solution lies not in finding an alternative to interest but to Banking itself. In this article, Ghamidi’s ideas regarding this subject have been presented. The basic premises include the assertion that Muslim citizens of an Islamic state are under no legal obligation to pay any other tax to the government apart from Zakah, that Zakah is levied on all forms of wealth produced, save three exceptions, and that the receipts from Zakah can be spent on all areas of state affairs at individual as well as collective levels. Questions as the problem of revenue generation and the advantages of a system based on this principle over those of systems based on other taxes have also been addressed. The rationale behind the marriages of the Prophet (sws) and explanation of the Divine directives in this regard. Based on Farahi’s research, this article attempts to dispel many misconceptions about the issue of the Prophet’s marriages.